Grilled Chicken with Buttermilk Marinade is juicy and flavourful. This Grilled Chicken Marinade made with Buttermilk, garlic, herb, spice marinade is easy and quick to make. Best for a quick weeknight dinner or for summer barbeques. Looking for the Best grilled chicken recipe? 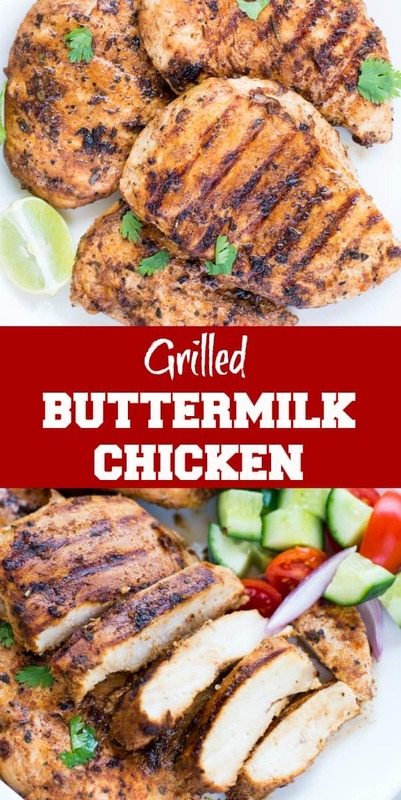 This Grilled Chicken with Buttermilk Marinade is one of the basic and most frequently cooked at my home. It is an easy, no-fuss recipe. All you need to do is plan a little ahead of time and marinate the chicken. Perfectly tender, moist and flavour-packed chicken breast can be used in many different ways. I usually make a rice bowl with diced Chicken breast, char-grilled veggies, some fresh salad and rice/ any grain. Sometimes I also serve them as it is alongside a fresh salad for dinner. This grilled chicken also works as a stuffing in a wrap. So it the most versatile Chicken breast recipe you will ever need. If you planning outdoor grilling this summer, then make sure you have this recipe bookmarked. Still, it is cold out there??? Make this grilled chicken in a grilled pan on stove top. Honestly, it doesn’t matter much in which method you are cooking your chicken. It is about Grilling chicken breast right. Chicken breast if not cooked in the right way, will end up dry and hard. So I have seen many people prefer Chicken thighs over the breast because Chicken thigh doesn’t get dry so easily. But believe me, Chicken breast can also be as juicy as Chicken tight if you take care of a few things. Next comes the marinade. 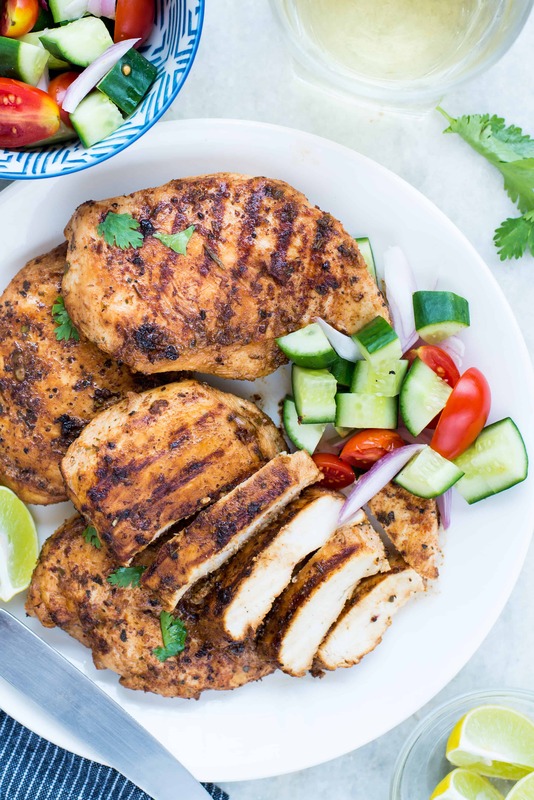 This buttermilk marinade is the best and easy grilled chicken marinade. Buttermilk, garlic, herbs and a couple of basic pantry stuff you would need for this marinade. Buttermilk makes sure the meat remains tender while cooking the chicken breast. Other herbs and spices give the required flavour. Dump all the ingredients in a zip-lock bag, chicken breast and refrigerate. HOW TO GRILL CHICKEN BREAST? These are the few tips that would ensure you Grilled Chicken Breast is tender and juicy. Begin by pounding the chicken breast to an even thickness. This step might not seem important. But this is one of the important steps and should not be missed. Chicken breast is not of uniform thickness. So when cooked the thinner part of the fillet drys out while the thickest part is still undercooked. Fillet of uniform thickness ensures even cooking. Use a meat tenderizer or a simple rolling pin, keep the fillet in between cling film and gently flatten the thick side of the fillet. This step is important if you have refrigerated the marinated chicken for more than an hour. Make sure you take marinated chicken out of the refrigerator at least an hour before cooking. Chicken fillets should be at room temperature while grilling, else it might not be cooked uniformly. Last but not least is the cooking/ grilling time. Once the fillets come to room temperature heat up your grill to the highest or if using a grill pan heat it. Grease the grill pan lightly. Grill each side for 3-4 minutes each side. Needless to say, overcooking would make the fillets dry and hard. If you are still not sure about the cooking time then check the internal temperature of the grill. It should be around 155 F – 160 F.
Once the chicken is done, Let it rest for 4-5 minutes before serving. CAN I USE ANY OTHER CUT OF CHICKEN? And that’s it !! Juicy and tender Grilled Chicken breast is ready. Grilled Chicken with Buttermilk Marinade is juicy and flavourful. 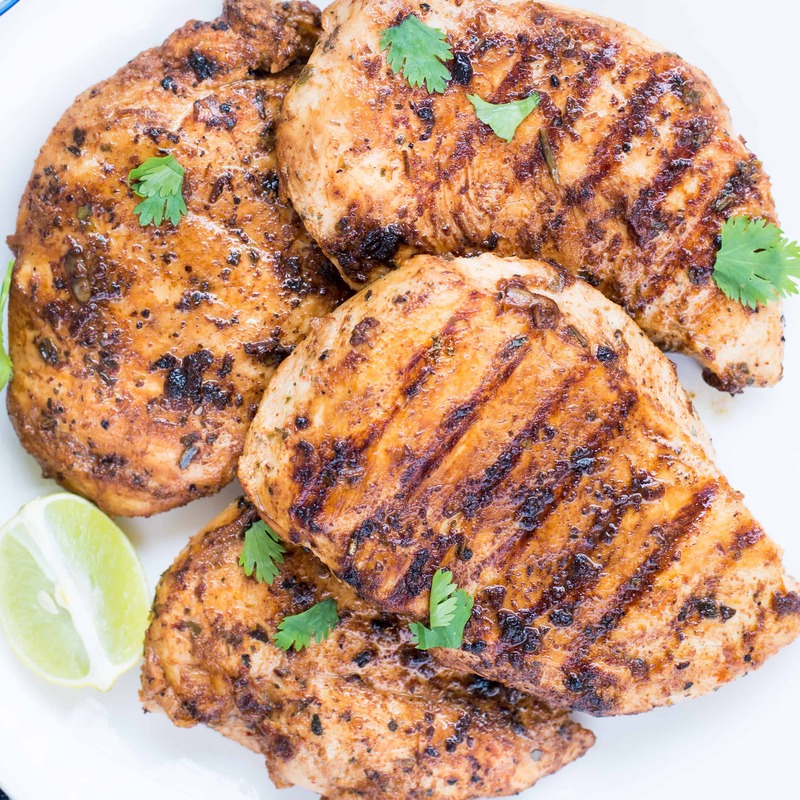 This Grilled Chicken Marinade made with Buttermilk, garlic, herb, spice is easy and quick to make. Best for a quick weeknight dinner or for summer barbeques. Pound chicken breast till it is of uniform thickness. In a ziplock bag, add all the ingredients. Check the seasoning. Add chicken breast fillets. Clode the zip-lock. Shake well everything. Marinate in the refrigerator for at least 1 hour up to 24 hours. Remove Marinated fillets at least 1 hour before cooking and let come to room temperature. Heat the grill pan or the outdoor grill to medium-high heat. Grease the grill lightly. Cook each fillet 3-4 minutes on each side. Bast with little marinade if required. Let it rest for 5 minutes ( if possible covered) before serving. 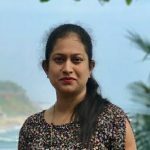 I have had issues in the past with my chicken coming out dry and after reading this I realize that I never pound the chicken to even thickness. I think this could be the difference maker. Thanks! Oh, I love chicken. Your recipe looks incredible! Very interesting combination of ingredients. I really like! I definitely want to try it and I’m sure it is very tasty. Thank you for sharing this great recipe! Saving this grilled recipe for the nicer weather that is coming. Look delicious for everything from a main course to a perfect topping on a salad. I can’t wait for grilling season weather! I will be making this asap! 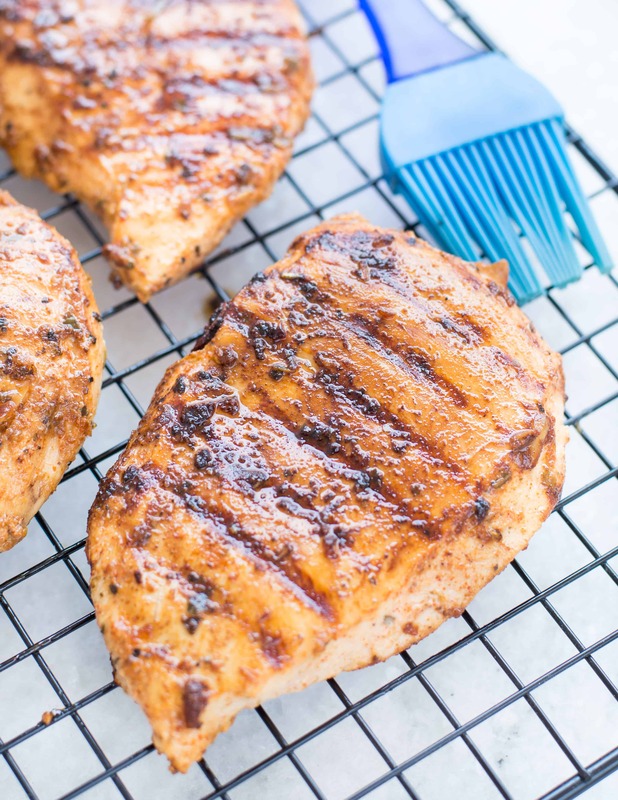 These grilled chicken breasts look so delicious! I love the tip you gave about pounding the chicken breasts so they are even! I never thought of doing that when grilling chicken! I look forward to making your delicious recipe!